Burning Moon's Inside advice: Bodies Revealed is at OdySea in the Desert! Have you heard of Bodies Revealed? No? well you are about to learn what it is and what it is about. 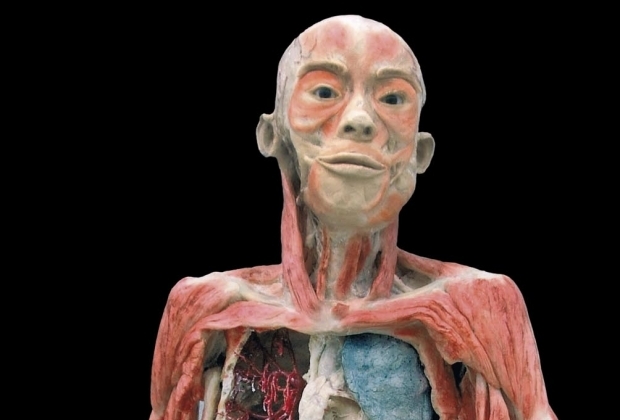 Bodies Revealed is a traveling exhibit that goes from state to state to show the public a interesting and in depth look at how the body works and what is inside of us. Bodies Revealed is currently set up on the second story of OdySea in the Desert near the OdySea Aquarium, they opened on May 12th and will be here until Next May. I wanted to note this review won't have as many photos as my reviews normally do, this exhibit does not allow photography inside of the exhibit and yes that included those who were there for the media night so the image above I pulled from the stock of Bodies Revealed photos on google. Everything you see at Bodies Revealed is real, every last body, organ, heart, etc is real. It takes the team behind Bodies Revealed one week to one year to get each specimen ready for show. They have so many different things to see it was unbelievable some of the ways they were able to display the specimens to show how everything lays in the body. There were a few things that might make a few people feel a little uneasy otherwise everything is pretty fascinating seeing exactly how many different working and moving parts you have inside of you. The exhibit was significantly larger than I thought it was going to be, it seemed to go on for quite some time and they had everything spaced out well so you aren't running into people while trying to take in everything. They also have several organs and even brains that show cancer and other health related issues. I don't want to give away too much of the exhibit so I will leave it off here and tell you to go see what it is all about. Tickets are $19.95 per adult and $14.95 per child or you can buy combo tickets that include one of the other attractions located inside of OdySea in the Desert. This looks interesting and informative. This sounds like it would be pretty neat to check out. This stuff has always fascinated me! i love it! I want to see this, this had to be such an interesting display! I had no idea about these bodies. I'm glad I stumbled upon your post. I have to show this to my daughter. She is all into science and bodies. She wants to be a forensic scientist when she gets older. I loved this exhibit when it was in Atlanta. I thought the nervous system was amazing to see, all those tiny little never ending under glass, and they were real, it blew my mind. This really does seem fascinating to see. I think it is worthwhile if someone wants to enter the health field to view. I have never heard of this. This would be interesting to see. I have started seeing billboards advertising this in my town!